“Holy Father, keep them in your name that you have given me, so that they may be one just as we are” (John 17:11). 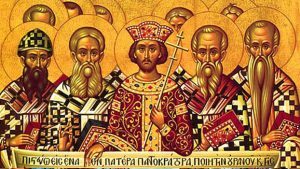 This Sunday commemorates the first ecumenical council (council of the whole Church), held in the city of Nicea, near Constantinople, in the year 325. The Gospel read on this Sunday is the final part of Jesus’ last teaching discourse to his disciples, just before he was arrested, as recorded by John. This gospel tells us about the whole divine plan for our glory and salvation. Jesus first tells his disciples that he must leave them. Leaving them, however, does not mean abandoning them. Jesus says, “I will not leave you orphans; I will come to you. In a little while the world will no longer see me, but you will see me, because I live and you will live. (John 14:18-19)” First, Jesus is going because he is the way, the truth and the life. (John 14:6). Second, “And if I go and prepare a place for you, I will come back again and take you to myself, so that where I am you also may be” (John 14:3). Jesus tells us, “It is better for you that I go. For if I do not go, the Advocate will not come to you. But if I go, I will send him to you” (John 16:7). Why? Because “when he comes, the Spirit of truth, he will guide you to all truth” (John 16:13). The climax of everything is that we will become like God, one in the Holy Trinity, “now I will no longer be in the world, but they are in the world, while I am coming to you. Holy Father, keep them in your name that you have given me, so that they may be one just as we are” (John 17:11). This is the glory of God, to bring all together in unity, for God is one. This does not mean that we will all be the same, for God has created us in a wonderous diversity, but we will all be united because there is only one truth, and we must live in the one truth. This is why the Council formulated the one truth about the one God, in the Holy Trinity. Each and every one of us must glorify God in the one truth, in “one mind and one heart” (Anaphora).